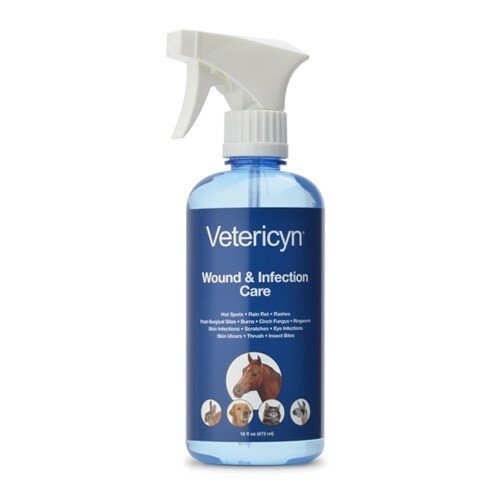 Vetericyn® Wound & Infection Care is an innovative topical solution for the care of wounds, infections and irritations caused by bacteria, viruses, fungi or spores. This steroid-free, antibiotic-free, no-rinse solution is non-toxic. Made up of compounds similar to those produced by the animal’s own immune system, Vetericyn will not harm healthy tissue. Vetericyn is pH neutral and will not sting when applied. This product, in solution, kills 99.999% of bacteria, viruses, fungi and spores including E.coli, Staph (MRSA), Strep, Moraxella bovis, Pasteurella, Actinomyces and Pseudomonas aeruginosa.